We visited Cleveland Ohio back in December for an Odd Spot on the A Christmas Story house and Harley and Brett had to return because Cleveland has so much more going on. 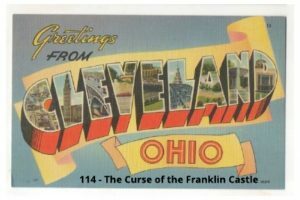 We start with the curse of Franklin Castle. There are a lot of rumors of death and dismemberment around this 1800s Victorian home. We discuss the history and the ghosts that have apparently moved into the house. Since we are back in town, we couldn’t pass up a short stop to the Buckland Museum of Witchcraft and Magic. This creepy little museum is a must see for a variety of reasons….we think they have the Necronomicon in the back. TableTop Board Game Café seems like it is right up our Diagon Alley. With over a thousand board games and food like their Savory Gravory Waffles…..waffles and sausage gravy….our arteries will be sweating for sure. Brett went rogue with The Top 5, and he broke the whole damn show.